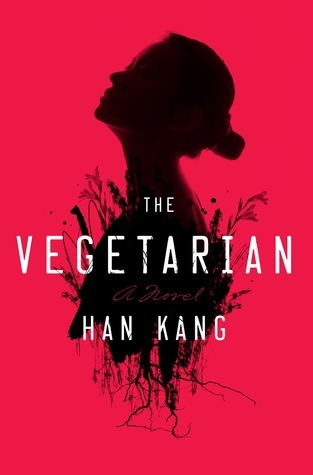 The Vegetarian by Han Kang. Hogarth, 2016. Hardcover. 192 pages. The Vegetarian is one of those books in which the entire time you're reading it, you have no idea what you're reading, and when you finally finish and close the book, all you can think is "what did I just read?" I'm still trying to figure out this book, and I'm still coming up with own interpretation of what Kang's message is meant to be. This is a striking novel that will make you feel intrigued, repulsed, impressed, and uncomfortable all at once. Kang's writing is deeply compelling and almost eerie at times, making this book impossible to put down. At just under 200 pages, it is one that can easily be read in one or two sittings. The initial cause that gets the entire plot of this book rolling is so simple, yet so riveting: Yeong-hye, the main character, begins having dreams that cause her to no longer have any desire to eat meat. Her opinions on the morality of eating meat and meat products seem to take a sudden turn and she suddenly stops, which shocks her husband and the rest of her family. It is their response to her sudden vegetarianism that eventually sparks the rest of the events of this book to unfold. I can't quite convey what it is about this book that makes it so compelling - perhaps it is the fact that it does not follow the traditional mold of most fiction books. The Vegetarian is broken into three parts: the first is narrated by Yeong-hye's husband, the second by her brother-in-law, and the final section narrated by her sister. Each of these characters brings a unique perspective to the current situation and also plays a large role in Yeong-hye's story, whether is is easily understandable or not. The first part of the book immediately introduces us to the fact that he is a despicable man who doesn't seem to care much for his wife, describing her as "completely unremarkable in every way." Each section is equally enthralling and provides many new issues to deal with along with the main conflict. There is so much to think about from this book, from the actions of her abusive husband, the inability of society to understand and respect other people's choices of lifestyle, gender roles, familial issues, and even sexual motives and manifestations. The idea of isolation as a result of one's unwillingness to conform to society is also one of the largest themes found within this book, and it is one that drives the bleak, unnerving atmosphere of each page. The ending is entirely ambiguous is up to the reader to interpret what the conclusion is - if there even is a conclusion that can be determined. I personally enjoy endings like this, despite the fact that I do sometimes feel frustrated by the lack of a firm ending, but I enjoy how it leaves so many possibilities available to dwell on. The Vegetarian is not an easy book to read, but I do think it is an important one. I'm curious to read more about other people's views on this book to see what they take away from this book, because I can see it meaning different things to different people, despite the constant underlying themes. Overall, I have decided on four stars for The Vegetarian, and I would recommend to anyone looking for something different or 'weird.' Just make sure you have plenty of time blocked out when you sit down to read - this one might prevent you from getting other things done! This book would also be great for those looking to diversify their reading choices, as Kang is a superb female South Korean author! This is one of those books that I keep eyeing but can't decide if I should read or not. After reading your review, I think I'm going to give it a try because it does sound like an important book. Great review!